An excess level of nitrate in drinking water is responsible for methemoglobinemia, or 'blue baby' disease. Consequently, management of nitrate in drinking water is universally of public health interest. In this study, clinoptilolite functionalised with cationic surfactant hexadecyltrimethyl ammonium (HDTMA) was used for the removal of nitrate from drinking water. The effects of surfactant loading, adsorbent dosage, pH, coexisting ions, temperature and environmental water quality on the adsorption of nitrate were investigated. It was found that adsorption was optimum when the initial concentration of the functionalising surfactant was 3 000 mg· -1. An increase in adsorbent dosage raised the percentage removal of nitrate. The valency of the coexisting anion had a major effect on nitrate removal, with the presence of phosphate (a trivalent anion) leading to the lowest removal ability. 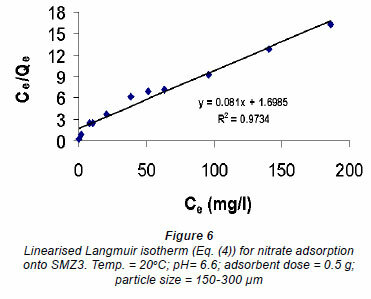 Temperature and pH had negligible effects on adsorbent performance. Environmental water samples (natural groundwater samples from Limpopo Province, South Africa) were tested and it was found that the World Health Organisation (WHO) regulatory compliance can be achieved even when the initial concentration of nitrate exceeds 300 mg· -1. Equilibrium data was modelled using the Freundlich and Langmuir isotherms and the data conformed well to the Freundlich isotherm, indicating the heterogeneous nature of the active sites. 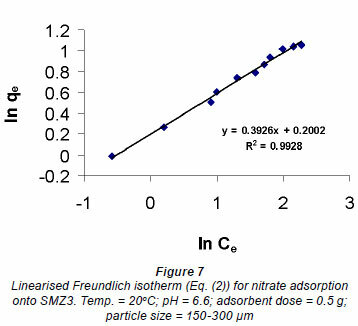 Kinetically, nitrate adsorption was best described by the pseudo-second rate equation. A number of rural communities in South Africa use groundwater for drinking purposes. In some cases this water is impure due to high concentrations of nitrates (Schoeman and Steyn, 2003). Pietersen (2005) reported that groundwater in South Africa often has high nitrate values, which exceed 50 mg· -1, the limit recommended by the world Health Organisation (WHO). Colvin et al. (2008) further noted that South Africa has some of the highest natural nitrate levels in the world (>500 mg- -1 NO3-N). Nitrates can spread in the environment either naturally or due to anthropogenic activities (Stadler et al., 2008). It is well recognised that the presence of excess nitrates in drinking water can be detrimental to a variety of living species, including man. A high concentration of nitrate in drinking water leads to production of nitrosamine, which is related to cancer and increases the risk of diseases such as methemoglobinemia in newborn infants (Mazeikiene et al., 2008; Bouwer, 1989; Samatya et al., 2006). Hence, reduction of nitrates in drinking water to permissible levels is mandatory. A number of physico-chemical technologies, such as reverse osmosis (Bohdziewicz, 1999), ion exchange (Bae et al., 2002; Clifford and Liu, 1993) and chemical precipitation (Ayyasamy et al., 2007) are available for nitrate removal from water (Schoeman and Steyn, 2003). However, some of these methods are either expensive, inefficient or not user-friendly. With the world economic meltdown, no country is spared, and thus countries are emphasising reducing costs as well as developing technologies which add value to the lives of people. It is therefore necessary to screen techniques to find which ones suit rural communities such as those of South Africa. In doing so, a number of factors that form the basis of a decision framework are considered. These factors include: cost, regulatory compliance and public perception and acceptance. For these reasons, a technique based on adsorption processes is an attractive alternative for rural communities (Onyango and Matsuda, 2006). The removal of anionic contaminants from water by adsorption methods has been widely studied in recent years. Interest is growing in the use of natural materials, due to their cost implication. One such material is zeolite (Bowman et al., 2000; Ranck, 2005). Zeolites are synthetic or naturallyoccurring hydrated alumino silicates with a cage-like structure, high external cationic exchange capacity and high surface area. The structural framework of zeolite is negatively charged due to isomorphic substitution of aluminium for silicon (Onyango, 2006). Thus, loading anionic contaminants like nitrates onto its surface is only negligibly possible, due to coulumbic repulsive forces (Kumar et al., 2006). Therefore, to render the zeolite suitable for anionic contaminant removal from water, its surface charge property must be altered using appropriate charge reversing chemical species (Onyango et al., 2004). While some researchers have utilised synthetic zeolites for water treatment, in this study we exploit the readily available and cheaper natural clinoptilolite from the Western Cape area of South Africa. There is hardly any information in literature on the use of this zeolitic tuff in purifying water containing health-hazardous anions such as nitrate. The study aims to demonstrate the performance of this material in nitrate removal from water, with respect to surfactant loading, adsorbent dosage, pH, coexisting ions, temperature and environmental water quality. The nitrate percentage removal and the ability to meet the local regulatory compliance are used as performance indicators. Equilibrium and kinetic modelling are done to estimate important capacity and rate parameters which can aid in system design. The analysis and design of an adsorption process requires information on the equilibrium adsorption isotherms and rate data. Moreover, the evaluation of the equilibrium data also helps in the investigation of mechanisms involved in nitratezeolite interaction. 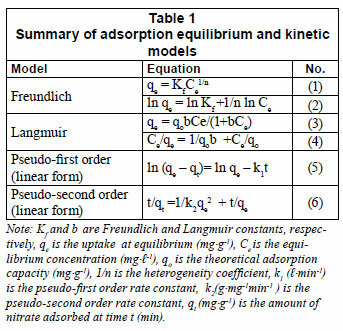 In this work, the 2 adsorption equilibrium models used are the Freundlich and Langmuir isotherms. Altin et al. (1998) indicated that the Langmuir and the Freundlich adsorption isotherms are the most widely used mathematical models, owing to their simplicity and ability to describe liquidphase equilibrium data in a wide range of concentrations. For brevity, a summary of the isotherm models are given in Table 1. The theoretical basis of these isotherms is readily available in the literature. Theoretically, an adsorbing species may occupy 1 or 2 adsorption sites. The kinetics of the former sorbate-sorbent interaction is described by the Lagergren pseudo-first order model (Uysal and Ar, 2007) while the latter is described by the Ho pseudo-second order model (Ho and McKay, 1999). Table 1 summarises the linearised pseudo-first order model (Eq. (5)) and pseudo-second order model (Eq. (6)) used in interpreting the kinetic data. Preparation of surfactant-modified natural zeolite. The natural zeolite used in this study was clinoptilolite supplied by Interscan Company, South Africa. The material was thoroughly washed with deionised water to remove dirt. Washed zeolite was then allowed to dry. To convert the zeolite to a final homoionic or near homoionic state, 20 g of the natural zeolite was treated with 2 M NaCl solution at room temperature over a period of 3 d. The solution was kept under agitation on a shaker operated at 200 r·min-1. After 3 d the solution was vacuum filtered and the conditioned zeolite prepared as such was double-washed with deionised water to remove excess sodium chloride. The conditioned zeolite (Na form) was then dried at 105ºC for 24 h.
Hexadecyltrimethyl ammonium bromide (HDTMABr) from Sigma Aldrich, South Africa, was used for surface modification. A pre-weighed quantity of conditioned zeolite sample was mixed with HDTMABr solution in 1:100 (solid: liquid) ratio. The concentrations of HDTMABr used for the preparation of surfactant modified zeolite (SMZ) were 1 g· -1, 2 g· -1, 3 g· -1 and 4 g· -1. The zeolite and surface-modifying solution were contacted in a batch reactor for 3 d. Finally, the solution was vacuum filtered, and the solid residue was double-washed with deionised water and air dried. The materials prepared in this manner are hereafter referred to as SMZ1 (for 1 g· -1HDTMABr), SMZ2 (for 2 g· -1 HDTMABr), SMZ3 (for 3 g· -1 HDTMABr) and SMZ4 (for 4 g· -1 HDTMABr). Fourier transform infrared (FTIR) spectroscopy analyses were undertaken on a Perkin Elmer Spectrum 100 spectrophotometer. The FTIR spectrum of the solid sample dispersed in KBr disk was obtained to determine the functional groups in the surfactant-modified zeolite (SMZ) and HDTMA. The spectrum was recorded in the region from 500 to 4 000 cm-1 with a spectra resolution of 4 cm-1. where qe (mg·g-1) is the equilibrium adsorption capacity, V ( ) is the volume of the solution and m (g) is the mass of the SMZ. Since natural water contains different anions in different concentrations, which may compete with nitrates for the available active sites, it is therefore imperative to study their effect on nitrate removal from water. The effects of the presence of sulphate, fluoride, phosphate and chloride on nitrate adsorption were studied. Tests were conducted in the presence of 10 mg· -1 of nitrate and 10 mg· -1 each of the co-existing ions. The adsorbent mass was fixed at 0.1 g per 50 m solution. The experimental procedure was similar to that described previously. In the kinetic experiments, the effect of particle size on nitrate adsorption was studied. The particle sizes used were: <75μm, 150-300 mm and 300-600μm. The sorbent was contacted with nitratecontaining (100 mg· -1) aqueous solution for a period between 0 and 60 min. A final set of experiments involved the use of natural groundwater samples collected from various locations of Limpopo Province. The samples were analysed for nitrate levels before contacting them with different masses of sorbents. 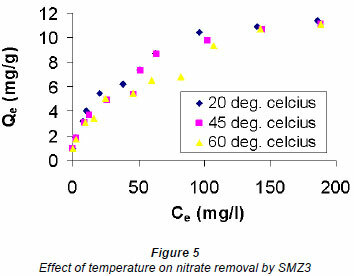 The equilibrium nitrate concentration was determined after 24 h.
The determination of nitrate in the filtrate followed the salicylate method (Monteiro et al., 2003). The absorbance of the solutions was measured at 410 nm using a UV visible spectrophotometer (Hach DR/3000). The raw zeolite used in this study was first conditioned with Na+ salt with the aim of removing certain cations from the structure and locating more easily removable ones, prior to any ion exchange application. It has been shown that the final homoionic or near homoionic state after conditioning zeolite improves the effective exchange capacity (Hui et al., 2005; Inglezakis, 2005; Athanasiadis and Helmreich, 2005). An FTIR study was used to explore changes in chemical stability and composition of the zeolite following conditioning and functionalisation. 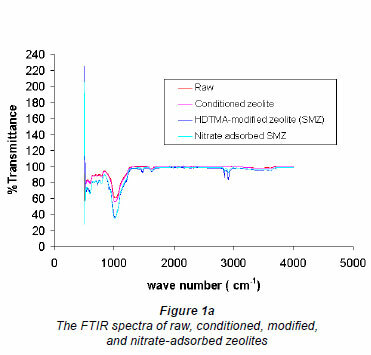 The FTIR patterns of raw, conditioned, surfactantmodified and nitrate-containing zeolites are shown in Fig. 1a. The raw zeolite and the zeolite in homoionic state (conditioned) show characteristic peaks at wave-numbers 624, 808, 993 and 1 594 cm-1. 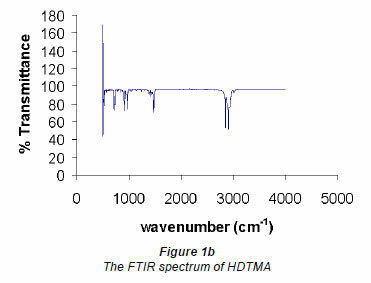 Upon functionalisation of zeolite, new bands are observed at 1 461, 2 848 and 2 915 cm-1, which can be attributed to HDTMA sorbed on the external surface of the zeolite, as the corresponding peaks are also observed in the FTIR pattern of HDTMA (see Fig. 1b). Nitrate adsorption on functionalised zeolite caused the bands at positions 1 461, 2 848 and 2 915 cm -1 to decrease in intensity suggesting that the active sites created by HDTMA were responsible for nitrate removal from water. This observation corroborated the fact that the nitrate adsorption was of a physical nature, probably due to electrostatic forces between positively charged surfactant-modified zeolite and anionic nitrates. Most band positions did not change following modification and adsorption, suggesting that the basic zeolite structure did not collapse. Nitrate is an outer-sphere complex-forming species and therefore its ample removal from water by adsorption is a challenge. In order to apply conventional adsorption media, their surfaces need to be modified to induce functional groups that can attract and adsorb nitrate ions. Recently, surfactants have been widely reported to aid adsorption of anions. Consequently, this study considers the use of positively-charged HDTMA as the surfacemodifying surfactant. Several studies have been reported on the use of HDTMA in modifying different kinds of adsorption media (Zhou et al., 2008; Wingenfelder et al., 2006; Yusof et al., 2009). 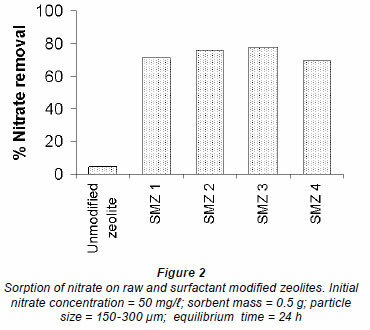 Figure 2 shows the application of unmodified zeolite and surfactant-modified zeolites in nitrate removal from water. The results clearly show that unmodified zeolite has very little adsorption capacity for nitrates. This observation concurs well with those of previous researchers (Schick et al., 2010; Mazeikiene et al., 2008; Li and Bowman, 2001). Zeolites are not good candidates for removal of anions from water because of their inherently negatively-charged surfaces that increase coulombic repulsion between the adsorbing anionic species and active sites. When the zeolite was functionalised with HDTMA (SMZ1, SMZ2, SMZ3, SZM4), a remarkable nitrate removal was observed. Surfactant modification of zeolite (clinoptilolite in this case) changes its surface charge from a net negative to a positive charge. Thus, electrostatic forces exist between the positively-charged zeolite and the nitrates in solution, which enhance nitrate adsorption. The nitrate removal increases with an increase in the concentration of the functionalising HDTMA and a value of 3 g HDTMA· -1 gives the best performance. Further increase of HDTMA concentration to 4 g· -1 results in a decline in removal of nitrates. This may be due to the fact that 4 g· -1 exceeds the surfactant critical micelle concentration; thus the micelles attach to the external surface of the zeolite and rearrange to form a bi-layer that tends to impart anionic characteristics (Bowman et al., 2000). Therefore, zeolite treated with an initial concentration of 3 g· -1 (SMZ3) of the surfactant appears to give optimal results and was used in all subsequent experiments. In reality the nitrate-contaminated water contains several other anions which can compete for the same adsorption sites. In order to explore the effect of interfering anions on the nitrate removal ability of the SMZ3, binary component systems were adopted in which nitrate removal in the presence of another anionic species was studied. The anions considered in this study included; phosphate, sulphate, chloride and fluoride. These anions represent both inner-sphere (phosphate and fluoride) and outer-sphere (sulphate and chloride) complexforming species. The nitrate percentage removal of SMZ3 for single component (nitrate only) and in the presence of other anions is shown in Fig. 3. In the NO3- single component system, the nitrate percentage removal is 99%. This value reduces to 90% in the NO3-/PO4 3 - binary component system. The binary systems involving sulphate, chloride and fluoride give 95%, 98% and 99% nitrate removal, respectively. Similar observations were recently reported by Saad et al. (2007) and Oztiirk and Bekta§ (2004). The trend in nitrate removal in the presence of coexisting anions seems to be related to the valence of the coexisting anions. Trivalent phosphate has the largest effect while monovalent anions give the least effect. These results suggest that electrostatic coulombic interaction plays a major role in nitrate uptake. The number of active sites relates to adsorbent mass and hence sorption performance. 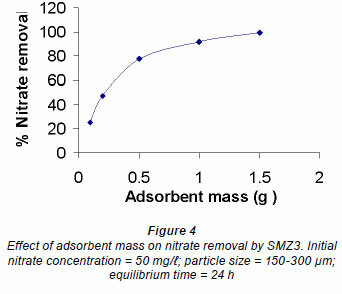 The effect of adsorbent mass on the nitrate percentage removal is shown in Fig. 4. It is clear that an increase in adsorbent mass resulted in an increase in the removal of nitrates from water. Specifically, nitrate removal increases from 25% when the sorbent mass is 0.1 g·(50 m )-1 to 100% when the sorbent mass is 1.5 g·(50 m )-1, due to an increase in available sorption sites. However, it is observed that the increase in nitrate percentage removal is not directly proportional to adsorbent mass. One plausible reason could be due to overlap of active sites at higher adsorbent masses resulting in reduced effective surface area required for sorption. Solution pH is one of the factors that have been found to significantly affect the sorption process (Onyango et al., 2006). A study was therefore undertaken to ascertain to what extent pH affected the sorption of nitrate. 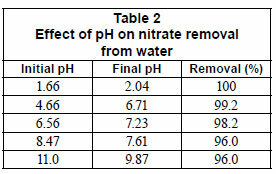 Table 2 summarises the effects of initial solution pH (1.6-11) on the removal of nitrate from water. The system (solution-solid) pH at equilibrium is also included. Results reveal that nitrate removal from water is marginally affected by pH. With no electrokinetic data at this stage, it can only be hypothesised that the surface charge on the SMZ3 was not significantly affected by pH changes. A confirmation is required to ascertain this. The slight decrease in nitrate adsorption with increase in pH could be due to interaction during passive transport in the pores and competition between OH- and NO3 anions for active sites. One disadvantage of using adsorption processes in removal of anionic contaminants from water inheres in most sorption media's inability to perform adequately at higher pH. Indeed several researchers have reported a significant reduction in media performance in nitrate removal from water at near neutral and alkaline pH (6.5-8.5), the pH range typical of natural systems such as groundwater (Chatterjee et al., 2009; Chatterjee and Woo, 2009; Cengeloglu et al., 2006). A media, such as SMZ3 used in this study, whose performance does not deteriorate with pH changes is desirable for water treatment. Meanwhile the pH of the system (solution-solid) after sorption was found to increase when the initial pH was acidic and to decrease when the initial pH was alkaline. This is due to the buffering effect of the zeolite. Sorbents normally shift solution pH towards their natural pHs or their point-of-zero charge (pHpzc) (Onyango, 2006). The effect of temperature was investigated in a range of 20-60ºC and is shown in Fig. 5. It was observed that an increase in temperature resulted in a minor decrease in nitrate uptake by SMZ3. This clearly indicates that the adsorption process was exothermic. 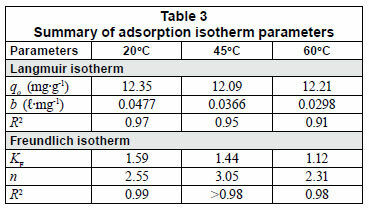 Similar observations in which adsorption decreased with an increase in temperature were recently reported by Chatterjee and Woo (2009) for nitrate adsorption by chitosan hydrogel beads. Temperature may or may not have a significant effect on adsorption depending on whether the process is chemical or physical in nature. When the process is chemical in nature, a higher energy barrier has to be overcome and hence temperature changes result in a significant (either a large increase or large decrease in adsorption) effect on adsorption. Conversely, a minor effect is normally observed when the process is physical in nature. The results of this study therefore reveal further that the nitrate adsorption process is physical in nature, involving coulombic electrostatic forces between the positively-charged SMZ3 surface and negatively-charged nitrate ion. where b is the Langmuir constant and Co is the initial nitrate concentration (mg· -1). The value of R indicates whether the isotherm is irreversible (RL = 0), favourable (0<RL<1), linear (RL; = 1) or unfavourable (RL>1). RL values between 0 and 1 were obtained suggesting the present sorption system is favourable. The Freundlich isotherm, which describes sorption on sites of different affinity for sorbate, was applied in the linear form expressed by Eq. (2) and is presented in Fig. 7. Linear plots were obtained with R2 in the range 0.98-0.99, suggesting a good description of isotherm data by this model. In a study of nitrate removal from water by ion exchange resin, Chabani et al. (2006) also found the Freundlich isotherm to give the best description of the equilibrium data. The Freundlich constants, Kf and n, calculated at 20ºC from this investigation, are 1.59 and 2.55, respectively. Values of n greater than 1 indicate favourable adsorption (Chabani et al., 2006). The Freundlich parameters for all the temperatures investigated are summarised in Table 3. To apply an adsorption process for large-scale treatment of water, a clear understanding and determination of the rate parameters is a prerequisite. Kinetic data can be used to determine the time required for sorption to go to equilibrium and to develop predictive models that can aid in system design. 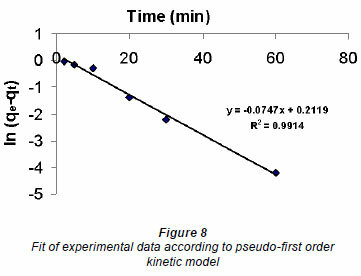 Two kinetic models summarised in Table 1 were used to fit the experimental data. The first was the Lagergren pseudo-first order model (Eq. (5)). A plot of ln (qe-qt,) versus t according to Eq. (5) should be linear if the adsorption process follows the first order kinetics. The equilibrium uptake in this case was used as a fitting parameter. For 150-300μm sorbent size, the fitting value of qe= 11.53 mg·g-1 was used. A typical plot according to Eq. (5) is presented in Fig. 8 for particle size 150-300μm. The curve is linear with regression coefficient R2>0.99. From the linear curve a rate constant k was determined from the slope and is 0.075 min-1. The first order rate constant, k1, is in the same order of magnitude for sorbent size <75 μm and 150-300μm (see Table 4), but significantly lower in magnitude for sorbent size 300-600μm. The latter is attributed to reduced external surface area for reaction and at the same time may be due to the increased diffusion path - a species has to travel a longer distance to reach an active site. Apparently, in adsorption, diffusive transport has an effect on the overall kinetics of the process. The nitrate uptake at equilibrium was determined from the intercept and is only 1.236 mg·g-1. The qe extracted from the intercept is extremely low and does not match the one used as fitting parameter. Hence the pseudo-first order model is not applicable to the present sorption system. The linear form of Ho pseudo-second order model, Eq. (6), was tested as a plot of t/qt versus t and is shown in Fig. 9. From the value of the regression coefficient, R2>0.99, it can be concluded that the pseudo-second order model describes the nitrate kinetic data. This observation is in total agreement with that of previous researchers (Ozturk and Bektas, 2004). The calculated values of qe and k2 are 11.43 mg·g-1 and 0.183 (g-min-1mg-1), respectively. In this case, the calculated qe value is almost the same as the experimental value and only marginally decreases with sorbent size. This observation is not surprising as sorption active sites are not normally dependent on sorbent size. 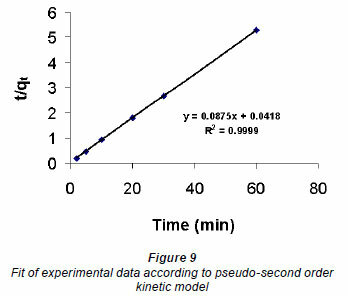 As a rule, the pseudo-second order kinetic model describes sufficiently the nitrate adsorption kinetic data. 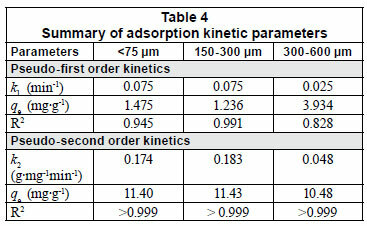 As with the case of pseudo-first order kinetics, the rate constant, k2, is in the same order of magnitude for sorbent size <75μm and 150-300μm (see Table 4), but is significantly lower in magnitude for sorbent size 300-600μm. Many rural communities in South Africa use groundwater for drinking purposes. With increased spells of drought leading to water scarcity, groundwater may form a major source of potable water in the near future. However, nitrate concentrations in some of the groundwater sources used for drinking purposes are above the limit of 50 mg- -1 (see Fig. 10), the maximum recommended by WHO. In this study, ability of SMZ3 to remove nitrate from environmental water (groundwater) was explored. The water samples were collected from 3 areas, Tshiozwi, Lesodi Motlala and Sekhokho, all in Limpopo Province. The residual nitrate concentration for the 3 water samples as a function of sorbent mass is shown in Fig. 10. First, an increase in sorbent mass resulted in an increased removal of nitrate from groundwater samples. This is attributed to increased sorption sites in the media. 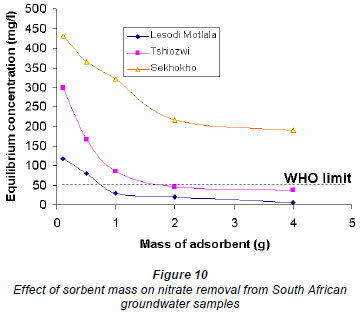 Second, at sorbent mass above 2 g, the residual concentration of nitrate in Chiozi and Lesodi Motlala water samples was below 50 mg· -1, while the nitrate level in Sekhokho water was still above the maximum allowable concentration (MAC) value. The latter is attributed to the extremely high level of initial concentration. Such high levels of nitrate in water may require combined systems for effective removal. HDTMA was successfully used to functionalise clinoptilolite and it was demonstrated that the latter is a low-cost and robust media for nitrate removal from water. The functionalised zeolite (SMZ) exhibited a nitrate maximum adsorption capacity of around 11.4 mg·g-1, which is sufficiently high for this class of natural media. The SMZ can be efficiently used over a wide range of temperature and pH without a significant change in performance. Hence, nitrate-SMZ interaction seems to be physical in nature, probably involving coulombic electrostatic forces. 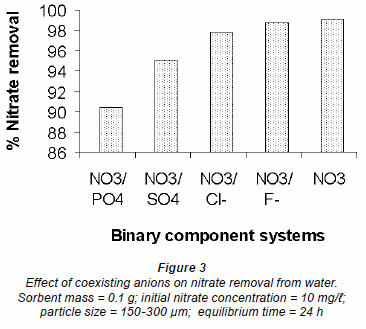 In binary component systems, nitrate sorption was marginally affected by the presence of co-ions. Meanwhile the equilibrium data were satisfactorily described by the Freundlich isotherm while the kinetic data fitted well to the pseudo-second order kinetic model. Results from application of SMZ to treatment of environmental water suggest that the maximum allowable concentration of 50 mgNO3· -1 is achievable even when the initial nitrate concentration exceeds 300 mg· -1. With South Africa being a water-stressed society, groundwater use is expected to increase with time. To ameliorate problems related to high levels of nitrate, low-cost technologies will be required. One such technology based on adsorption using SMZ could be appropriate. Further studies will, however, be required to scale-up and optimise process variables. The authors wish to extend their gratitude to Prof. Maggie Momba of the Department of Water Care, Tshwane University of Technology, for availing the UV spectrophotometer used for nitrate analysis. Received 2 December 2009; accepted in revised form 3 September 2010.